Predict the outcome of a given key business indicator based on the interactions of other related business drivers - forecast and estimate what is going to happen in the future. CleverQ forecasts using best fit analysis of several different regression analysis trends and then reapplies the seasonal trends so you can get a birds eye view into the future. 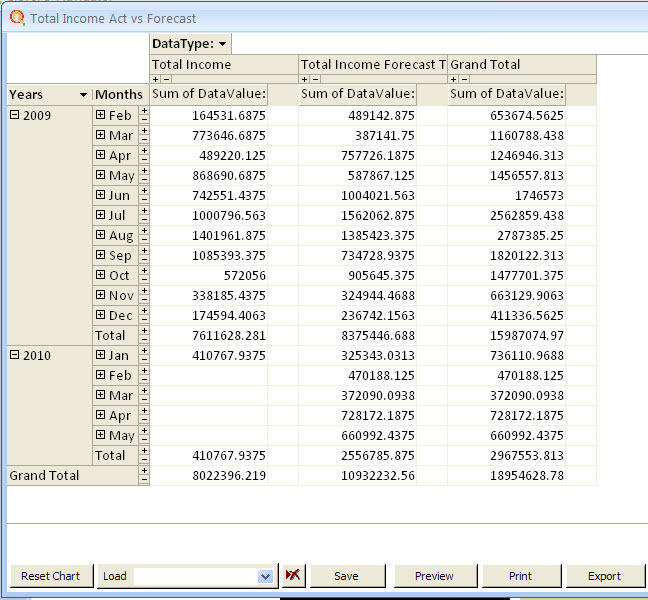 Forecasting is the first step to proper budgeting. Special forecasting functions can calculate a number of different types of regression analysis including "Best Fit" synopsis adjusted for seasonal trends. After forecasting data has been calculated, it can then be exported to Excel and then be further adjusted to your business situation, and imported into your budgeting software or a budgeting table. Export your forecasts to excell to do further analysis if desired. Then Compare your Actual data to Budget durring the year to monitor your performance. CleverQ can show your progress on gauges, graphs and charts how you are doing compared to budget. CleverQ can even reapply the seasonal trends to your annual budget to create the monthly values for you.